Stephen Colbert’s Late Show is getting a new executive producer and showrunner: Chris Licht, the well-respected news veteran who co-created MSNBC’s Morning Joe and currently produces CBS’s early newscast CBS This Morning. Licht’s hiring is not a shake-up, per se, since none of Late Show’s current executive producers are leaving. Instead, industry insiders tell Vulture the move is designed to bring focus to Late Show, which after a strong start last September, has seen its ratings drift downward. 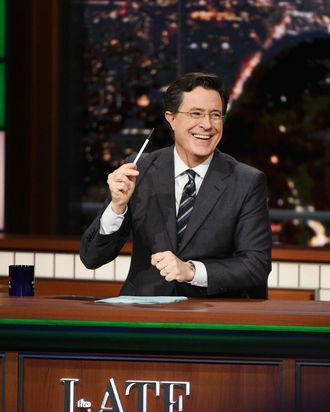 Colbert has essentially been serving as his own showrunner, with executive producers Tom Purcell and Meredith Bennett doing the heavy-lifting on creative and business aspects of the show, respectively. Licht’s job will be to bring order to the creative chaos that is Late Show, which currently veers all over the map, from Colbert Report–like political satire to wonky interviews with Silicon Valley tech execs. Sources tell Vulture Licht’s hiring sprang from conversations CBS News chief David Rhodes and CBS Corp. supreme leader Leslie Moonves were having about Licht’s future at the network. Licht may have been itching for new challenges, and Moonves — perhaps sensing Late Show could use a new rudder — suggested Licht move over to late night. Licht’s No. 2 at This Morning, Ryan Kadro, will take over the top spot in the morning. Today’s announcement will almost certainly prompt speculation that CBS execs are unhappy with Late Show, but that would be an oversimplification of the situation. The general consensus inside the network is that Colbert has brought exactly the kind of humor and intellect to the time slot they were expecting from him, and that the show’s ratings — while perhaps a bit below where the network might have wanted — are fine. (It also helps that Colbert’s show costs considerably less to produce than Letterman’s did.) That said, the Licht hiring suggests CBS (and Colbert) believe Late Show might benefit from a set of outside eyes. Bennett and Purcell were both veterans of The Colbert Report, and as such, were logical choices to follow their boss to his new CBS show. However, there’s a big difference between making four half-hours of TV for cable and churning out five hours on a big network. The logistical challenges of simply getting Late Show With Stephen Colbert off the ground were huge, and probably made it harder for the creative team to step back and make adjustments to the format. Licht seems suited to offer an outsider’s eye and, CBS and Colbert no doubt hope, bring new momentum to the show.